Heisei Democracy doesn’t appear to be resuming posts any time soon, so I’m dusting off this review and posting it here. I finished Mana-Khemia in May, and the English version has been out for a while now. If you haven’t played it, you may find it to be a good way to enjoy some solid Gust gaming while you await the delayed English release of Ar tonelico 2 in January. Ar tonelico 2 is a tough act to follow, or to precede. Mana-Khemia did both: I played through half of it, then Ar tonelico 2 came out and I played that for six months, then I picked Mana Khemia back up. As of this writing, Mana-Khemia 2 has just come out. Gust makes games rather faster than I can play them. 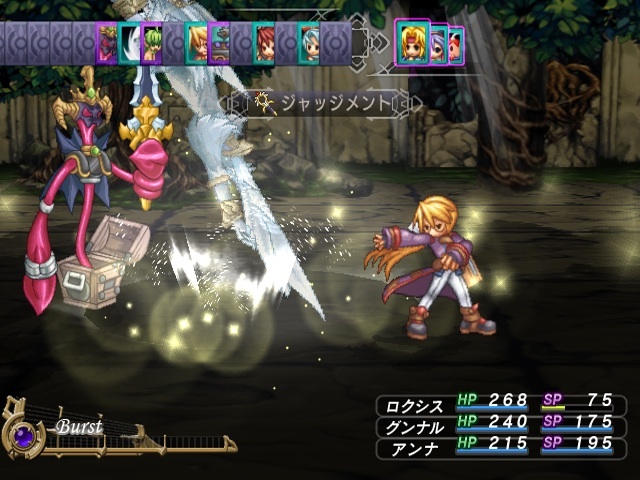 Mana-Khemia is the ninth game of Gust’s venerable Atelier series. 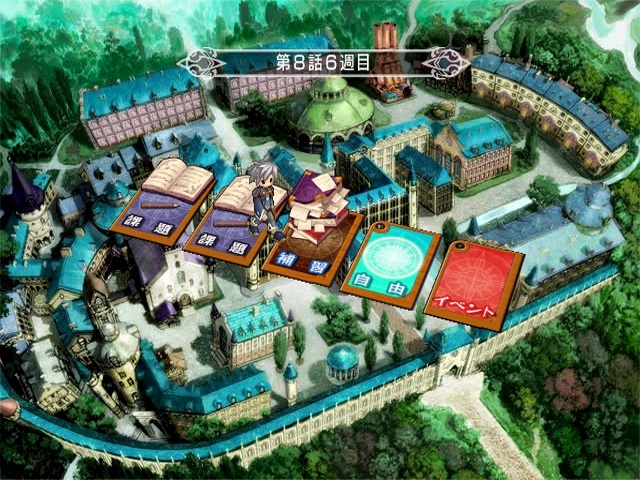 The series encompasses several arcs, each with its own setting and atmosphere, but every game’s premise begins with being an alchemist, crafting items in a workshop. This installment begins the fourth arc, and it follows the previous game, Grand Fantasm, in eschewing most of the epic RPG trappings that the series briefly entertained in the Atelier Iris arc. 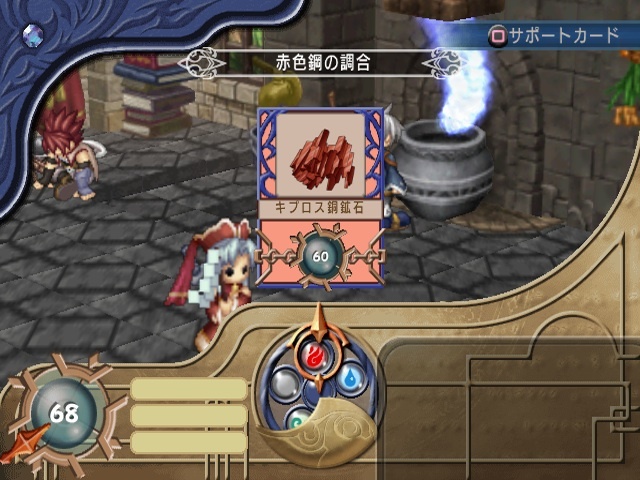 Instead, it returns to the alchemy, local exploration, and character interaction focuses of the original Ateliers. On top of that framework is a fantastical school setting: quests are really homework, and failure in battle merely results in a trip to the nurse’s office. What does this mean for button trancers like you and me? 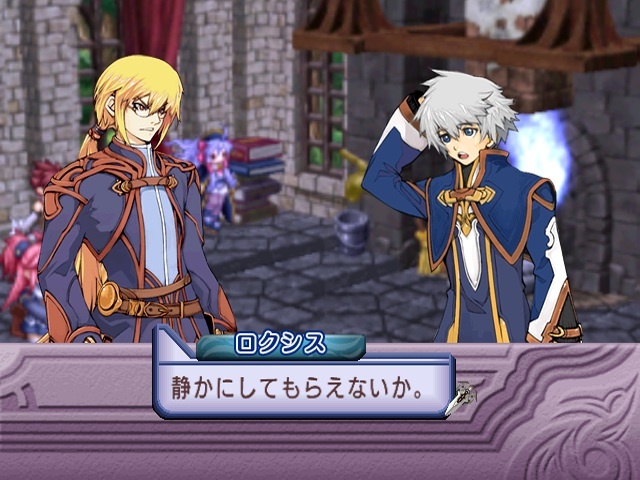 As in my Ar tonelico 2 column, I’ll examine Mana-Khemia in terms of infatuation, completionism, and immersion. The game has a cast of likeable, sparklingly energetic characters. The several portraits for each character (by Yoshizumi Kazuyuki) are superb, and I may get strung up for writing this, but I think they even rival the original Atelier Marie masterpieces by Ohse Kohime. The voices are all-star and spot-on throughout the game, and there’s even a little bonus blurb from each voice actor in the Extras section when you finish the game. It’d be hard not to fall for these characters, and I certainly did. Even Mrs. Jetfuel found herself taking a liking to Gunnar, the beguilingly gruff super-senior, and Vayne, the quiet-but-warm-hearted protagonist. Nike even convinced me to reverse my usual anti–spunky-catgirl stance, thanks to a brilliant voice-acting job by Sawashiro Miyuki (who in Ar tonelico 2 portrayed the unrecognizably different, but equally impressive, role of the haughty aristocrat Chroche). The school setting is a smorgasbord of convenient infatuation hooks: everyone wears cute uniforms (each somehow in their own distinct style, even for characters in the same class); the school nurse Melhis is a fetishized temptress; there are summer vacations and culture festivals and graduation ceremonies and all sorts of other nostalgic, idealized school-world set pieces. But, Atelier is not really about deep involvement with characters. You get some morsels of story for each character, and you can steer the exposition a bit to see more of the characters you’re interested in. But nothing happens that’s serious enough to leave you with a lasting, pining connection to anyone. That’s just the way the game is: sugary, positive, humorous, and all-around a fun romp through a colorful world. I like Philo well enough, and the PVC figure of her that came with the limited edition box of the game is a pretty addition to my desk. 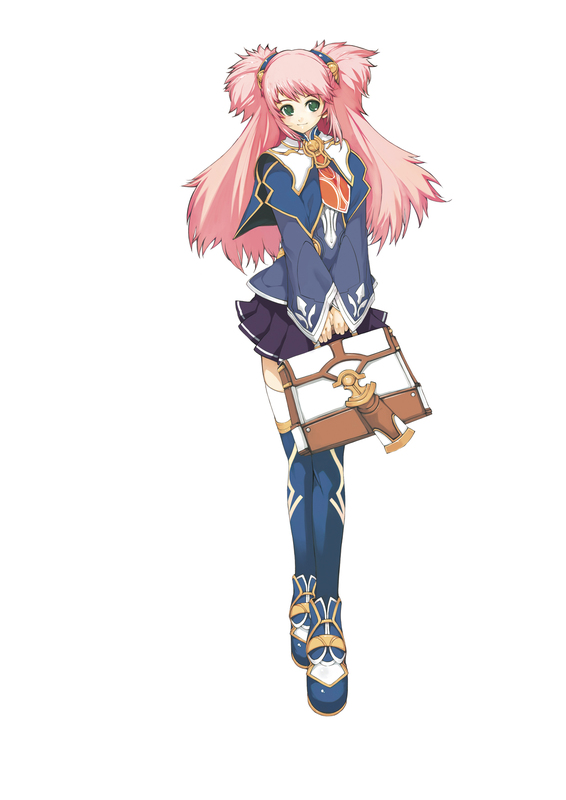 But she won’t be joining my pantheon with Ar tonelico’s Shurelia and Sakura Taisen’s Kouran as a dear companion on unforgettable adventures. 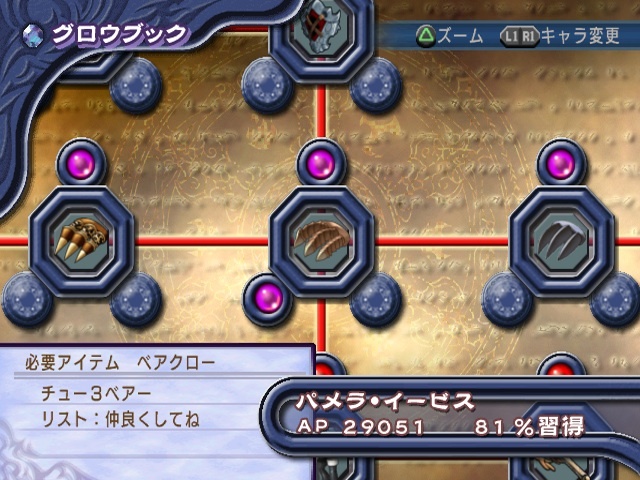 This is where much of Mana-Khemia’s value is. The missions – the homework assignments – are somehow more fun than similar quests in Grand Fantasm, possibly because of the atmosphere so pleasant that it seems like a reaction to that game’s off-putting nature. The various systems are so well interwoven that I didn’t get tired of playing with them. This is unlike Ar tonelico 2, where the game let me neglect most of the sub-systems and get way out of sync with how far along I was expected to be in each one, thus requiring me to grind through lots of crafting, baths, Diver’s Therapy, and conversation events. Not that they weren’t still fun, but the fantasy was harmed. Here’s how it works: on homework assignments, you explore dungeons around the school, collecting alchemy components and fighting cute monsters. As you fight, you gain AP. You may also come across recipes. With your new recipes and components, you can visit the atelier and the athanor to craft new items. Each character has his own Grow Book, a Final Fantasy X–like field of nodes which become unlocked as you craft certain items. When you unlock a node, you can use AP to fill it in with gems, thus improving the character’s statistics. Once you’ve equipped your new items, filled in all of your Grow Book nodes, and handed in your homework, you move on to the next week. This process keeps iterating, opening more opportunities for more complex items and abilities, until in the last chapter I was happily running around for half an hour running various errands in order to create a single item. The game doesn’t offer a whole lot in the way of traditional rhythmic button-tapping immersion, such that you let everything around the TV fade away and just drift through the game. The closest thing is probably when you’ve got a good chain of item-crafting and leveling up going on, as mentioned above. One nice thing, though, is that the game enables and encourages you to pursue side stories with members of your party: during free periods, you can approach one of the characters in your atelier and start an event focused on them. These vary from helping someone study to pretending to be someone’s boyfriend so that her geeky fan club will leave her alone. I mostly followed Philo’s path, and in the end I was presented with a sentimental little scene and an ichimai e, the type of CG drawing you get as a reward in visual novels. Mana-Khemia is like a nice pancake brunch: sweet, delicious, and a fine meal to fill me up until dinnertime, but rather homogenous and not all that wholesome. It’s enjoyable, but it’s more of a game to tide me over until the next Ar tonelico than it is a game to revere for itself. It certainly ranks with Atelier Iris 2 as a memorable Atelier game, and it was absolutely worth playing through to the end.